Welcome to Stockwell's blog. We use our blog to provide regular updates about what's on at Stockwell. 399 Montague will create an exciting fusion between the living & working environment of West End. This new retail & commercial hub will service the ever growing population of Brisbane’s inner south. The building offers ground floor retail , with an additional 4 levels of commercial space. Located in the heart of this urban renewal precinct, 399 Montague benefits from great connectivity to the areas transport linkages and future retail developments – being adjacent the proposed supermarket and specialty store offering on the corner of Montague and Ferry Roads. Boggo Road Urban Village is unprecedented. From its elevated position less than 3 kilometres from the CBD, Brisbane’s most anticipated development is primed to become the inner south’s favourite destination. Located off Annerley Road in the inner city suburb of Dutton Park, this development will offer a diverse retail & commercial emporium, with all major transport options conveniently located on its doorsetep. This future retail precinct is set to seamlessly marry the old with the new, combining the charm and ambience of the heritage gaol with the future minded CSIRO Ecosciences precinct, proposed Inner City South State Secondary College and proposed grocer, cafe & restaurant precinct. The Boggo Road Commercial Tower showcases contemporary urban design and will comprise a high quality office environment, located in an elevated position overlooking Brisbane’s CBD. 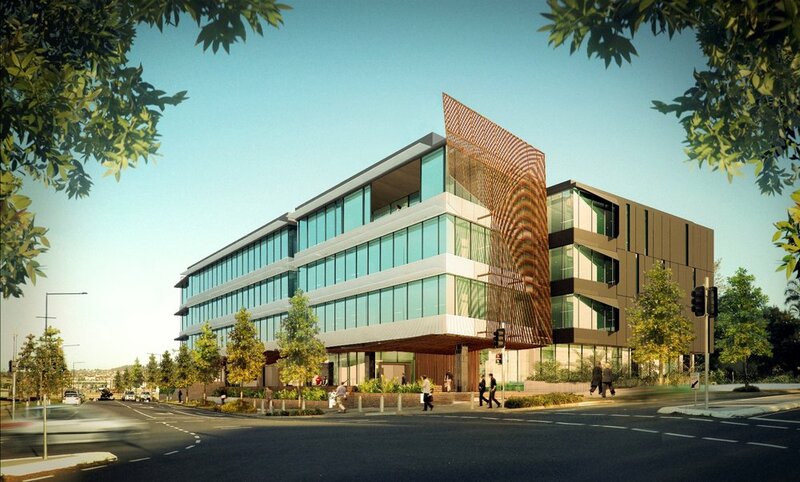 The building will deliver the highest standard of finish and office facilities. The project will provide a unique commercial outcome, providing a level of amenity and connectivity for staff unobtainable elsewhere in Brisbane. The development forms part of Brisbane’s knowledge base precinct, connecting the CBD with Queensland’s major education and health facilities. The University of Queensland, QUT and Griffith University are all located within 1.8km of Boggo Raod. as well as major research and science facilities create a unique opportunity for business growth in these sectors. Bargara Meats and Bargara Domino's opened their doors to their customers on Monday 12th June 2017. Both Dan (Bargara Meats Owner) & Tom (Bargara Domino's Owner) are trading well and have had positive comments from customers flocking to check out their new stores. Stockwell Funds Management is pleased to announce that the Virtuoso Investment Trust is now fully subscribed. The Trust is forecast to provide cash returns of 15% p.a.to investors over a 24 to 36 month investment term. Established to raise up to $17.3 million from wholesale/ sophisticated investors, the Trust will provide Stockwell with a finance facility for the development and construction of the owner occupier targeted Virtuoso Riverfront Apartments in Brisbane's West End. If you have missed out on investing in this Fund, feel free to contact me on 0411 492 111 or andrew@stockwells.com to enquire about our current and future investment opportunities. To learn more about Virtuoso Riverfront Apartments which is now under construction click here. Work is underway on Virtuoso, Stockwell’s latest riverfront development in West End following today’s official sod-turning ceremony. Lord Mayor Graham Quirk and Mark Stockwell led the event with a speech on the growth of Brisbane and how West End is a key factor contributing to Brisbane’s future success. Mark Stockwell says that “starting construction on Virtuoso is a significant occasion for Stockwell and West End as we are working against the trend seen in Brisbane’s current property market”. “The riverfront development is a result of 20 years of building and development experience in West End. We have spent this time listening to the local market to learn and understand their needs. Virtuoso has been designed with this in mind and delivers 3, 4 and 5 bedroom luxury home-sized residences on the riverfront”. “We could have built 250 apartments on site, however, we have listened to the local market and developed 77 owner occupier residences with a focus on size and premium finishes” says Stockwell. Residents who have purchased chose Virtuoso as it is a property suitable for their lifestyle, with one resident explaining “It’s by the river and so close to the city, everything is here. It’s a celebration of life, living in West End”. The premium riverfront location of Virtuoso allows for a luxurious lifestyle. West End and neighbouring South Bank are renowned as two of Brisbane’s leading dining and entertainment destinations. The site is also surrounded by Orleigh and Davies Parks. Construction has now officially commenced and completion is anticipated towards the end of 2018. The onsite display suite will remain open daily from 10am to 4pm until further into construction. Surprise Gifts and Homeware opened its doors to the public on April 8. Situated at Northern Beaches Central, the store stocks an ever changing range of goods for homes, gardens, parties, bathrooms, arts, crafts, plus more. Surprise Gifts & Homeware has opened a 300 square metre store at the Woolworths section of the shopping centre, which makes it the third biggest shop at the centre after Coles and Woolworths. Store manager Michaela Balfour was brought up from the owners' first store in Bargara to help establish the new business. Stockwell is pleased to announce the successful conclusion of the Riverpoint Investment Trust. The Riverpoint Investment Trust was established for wholesale/ sophisticated investors, and has returned $17m of capital and interest to unit holders. The Fund provided Stockwell with a finance facility for the development and construction of Riverpoint Apartments in Brisbane’s West End. Investors received cash returns of 15% per annum (simple interest) over the 27 month investment term, with no fees payable by investors. Mortgage and company guarantee securities were also provided. Following the success of this Trust, we are pleased to announce the release of Stockwell’s latest unlisted managed investment scheme – The Bribie Lifestyle Village Investor Trust. The Bribie Lifestyle Investor Trust is to raise an average annual return of 20% for investors over the short term, underpinned by a master-planned Manufactured Home Estate Lifestyle Village on Bribie Island in South-East Queensland. If you are interested in investing alongside Stockwell, an experienced property developer with a proven track record of delivering successful projects throughout Queensland please contact Andrew Dalton on 0411 492 111 or at andrew@stockwells.com. An Opportunity Brief providing further information on the Bribie Lifestyle Village Investor Trust is available by clicking here. The team at Muse have seen another exciting month on site with construction progressing well. The kitchens are starting to take shape with the installation of all the beautiful Bosch kitchen appliances in hot pursuit of the joinery work. In addition, the electrical and plumbing service fit off has begun on site. External render is complete on the ground floor and from level 3 through to 6. The Hutchinson's team are progressing well on site at Boggo Road Village and the building is beginning to take form. All milestones set for Hutchinson's are continuously being met and Stockwell is very happy with how construction is progressing. Poinciana Place Shopping Centre sells for a record $17.3 million. Poinciana Place Shopping Centre in Tewantin, developed by Stockwell, has sold for a record $17.3 million on a record yield of 5.9 per cent for the Sunshine Coast. The shopping centre was then subsequently acquired by an unlisted property investment fund established by Stockwell Funds Management in 2013. Head of Stockwell Funds management Andrew Dalton said the shopping centre has been a great asset for investors in the fund and had delivered outstanding annual returns of 19.2 per cent and a return on equity of 54 per cent over a three-year period. Read the below articles published in the Australian Financial Review and Courier Mail to find out more. A very exciting day today at Bargara Central with the opening of ALDI. This marks a significant day in the Centre's history. We have been a part of the Bargara community for almost 20 years and we are immensely proud of the Centre. Stage 1 at Boggo Road Village is complete and we have welcomed the first residents to the precinct. This marks an important step in the area's revitalisation and is the start of amazing things to come in this unrepeatable project. Blossoms Flower Boutique has expanded at Northern Beaches Central. Katie expanded her already flourishing Florist business into the hospitality industry, with an expansion that saw her open a coffee shop. Drop into Northern Beaches Central for a coffee date, lunch or if you have a sweet tooth, a slice of freshly made fudge. Stockwell is proud to sponsor the Rose-Anne Kelso Commemorative Award 2016 with Life Sciences Queensland. Rose was one of Stockwell's directors and was passionate about science, women and networking. This award recognises these passions by supporting the winner to attend a conference that will help them advance their career in the life sciences industry. This year's winner Dr Joanne Macdonald is leading research into pathogen detection including the development of new generation platforms for the diagnosis of deadly pathogens and will attend a conference in Singapore. ALDI works are progressing, with handover from Stockwell to ALDI in October for internal ALDI fit out to commence. Works in the Woolworths expansion space are progressing for handover with Woolworths to commence internal fit out at the start of October. Development and expansion works are still tracking towards opening prior to Christmas. Speciality store, Bargara Bakery, have commenced fit out. Flowerama Opens at Stones Corner Village. Stones Corner Village welcomes Shirley and her fabulous flower shop to the vibrant outside precinct of Stones Corner Village. Located next to Caffe Di Moda, Flowerama is full of energy and overloaded with bright and striking flowers. Spotted on Friday - Stockwell's Managing Director Mark Stockwell in the Courier Mail's lift out Queensland Business Monthly. Stockwell Funds Management is proud to launch its next investment fund. We are currently raising $13,000,000 in equity for a development fund with targeted returns of 20% p.a. (simple interest) and staged capital repayments over the course of the project. Sea change location 69km north of the Brisbane CBD. Adjoins Bus Terminus, Shopping Centre and short distance to High Street and Beaches. Targeted at 50 plus age group seeking downsizing and lifestyle community and affordable housing. Managing Director Mark Stockwell talks about Stockwell, Muse and his love of West End. Stockwell has plans to develop a commercial and retail building on the site of our head office at 399 Montague Road, West End. We’re currently talking to prospective retail and commercial tenants and welcome enquiry from those looking to join our favourite suburb. We love having our offices in West End and we know other businesses will love the proximity to the city, the culture and the easy access. We had a new sign installed on site this week - here's some pictures of the install. Construction has kicked off on site at Bargara Central as we prepare for Woolworth's expansion and the addition of ALDI in the old IGA tenancy.